The name was originally spelled trifid and pronounced "TRY-fid". The name means three-lobed, referring to the three root/legs. Fid comes from the Latin -fidus meaning divided. Triffids have a straight stem, springing from a woody bole which is shaggy with little rootlet hairs. This bole is roughly spherical with three bluntly-tapered projections extending from the lower part. These can dig into the soil to function as temporary roots. At the top of the stem is a funnel-like formation which has a tightly-wrapped green whorl within resembling a rolled fern frond. This whorl is sticky and can lash out at passing animals. It carries a sting which can kill a full-grown man; the poison is carried in sacs at the base of the sting. 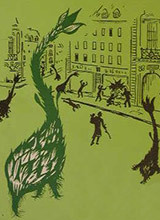 Although not described in the book, John Wyndham's illustrations (see below) show three stamen-like stalks within the cup. They have three small, bare sticks which grow straight up beside the stem. These "clatter sticks" create a rapping noise which is considered to be some form of communication. It is clear from experiments that they can hear or, at least, sense vibrations in the air. There are also short sprays of leathery green leaves. At the age of one year, they reach a height of approximately half their full growth which averages a little over 2 meters/7 feet in Europe, reaching a maximum of about 2.4 meters/8 feet. In the tropics, they grow taller and quicker with a maximum height of 3 meters/10 feet. 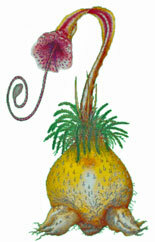 Triffids are the only known plant capable of ambulatory movement. They can lift themselves about 30 cm/1 foot off of the ground on the three projections on their boles. They walk rather like a man on crutches, sliding two projections forward and then lurching so that the third comes level with them. At each 'step', the stem whips violently back and forth and the leaves rustle noticeably. The speed is about that of average human walking pace. The triffids propagate by expanding the dark green pod just below the cup until it bursts, broadcasting millions of white seeds into the air. These float for many kilometers in the air. The usual season for this in Europe is late August. Ninety-five per cent of these seeds are fortunately infertile. 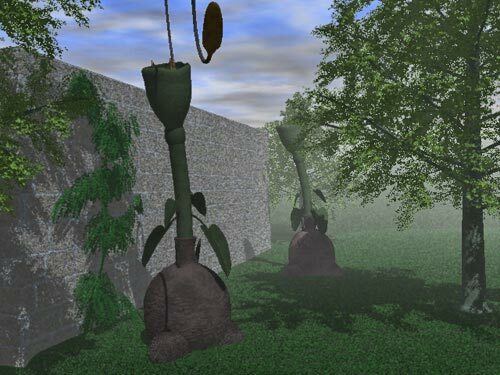 Triffids are primarily carnivorous, digesting any insects that are caught in the sticky area within the cups. But they are also capable of assimilating larger animals by killing them with their stings and absorbing them as they decompose with the sting, tearing off pieces of flesh and dropping them into the cup like an elephant's trunk. The green sting is carried in the coiled whorl within the cup. It can reach up to 3 meters/10 feet but the range can be increased by 1.2–1.5 meters/4–5 feet if it sways forward beforehand. The most common tactic is too wait in suitable areas for unsuspecting prey to pass by and then strike out with the sting which usually kills extremely quickly (presumably to prevent the prey fleeing). They tend to prefer waiting in areas where they can dig their roots temporarily into the ground. Triffids have been observed driving blinded people, presumably into traps. They are very sensitive to movement and sound, and will gather together when certain sounds are 'heard'. 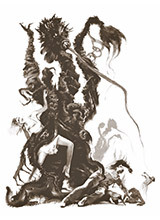 If the noise is short, such as a shot, the triffids lose interest after a while but, for a sustained sound such as an engine, they will remain, often forming a large mass around the target. The sting is usually aimed at the head, leaving a red weal. Against clothing or on fur or hair, it is ineffective. It is normally fatal but people can survive in certain circumstances, if the poison sacs are depleted from previous stingings; for instance. Also a hit away from the head, such as the hand, can be survived by the application of anti-venom or, if unavailable, tourniquets and fomentations to extract the poison. Even so, the result is a long period of illness in bed. 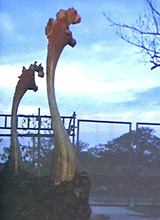 Triffids communicate by a drumming of the three clatter sticks. A triffid which is attacked will often drum these sticks, drawing others to its defence. Removing the clatter sticks causes a triffid to gradually deteriorate. No structure akin to a brain has ever been found within a triffid but many believe they have a collective intelligence like ants or bees. Right from early times, triffids have been farmed for their oils and juices (which may have been the purpose for their development). Originally, the sting was docked (it takes about two years for the sting to regrow) but, when it was found that the quality of the oil is better with the sting intact, this habit was stopped. Consequently the triffid keepers have to wear protective clothing. Triffid oil is pale pink and it takes 5–6 years between planting a triffid and gaining full oil production. Oil cake is very nutritious and used for stock feed. Mashed triffid is also given to cattle and, being highly nutritious, can be eaten by humans if necessary although frowned upon. 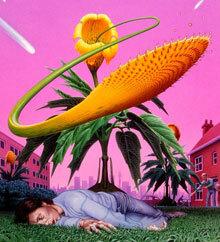 Common methods of self-defence against a triffid are fleeing (they can only move at walking pace), blasting with a shotgun or decapitating with a triffid gun (which fires steel boomerangs called 'bolts'). Bullets are less effective since a triffid can absorb much damage before dying. Removing the top will make them safe but not kill them and, to prevent them calling for help, it is wise to destroy the clatter sticks. The stems do not snap but can be mangled. They apparently evolved (or were developed) in Russia, the first experimental triffid station being in the district of Elovsk in Kamchatka. During an attempt to smuggle seeds from the Soviet Union to the West, the aircraft carrying them was destroyed, broadcasting the seeds into the atmosphere. Consequently they began to appear all around the world.